Several years ago, I was on a road trip through New Mexico, after attending an IPCC (International Professional Communication Conference) in Santa Fe. Just outside of Albuquerque, a sign warned me that “gusty winds may exist.” I had to pull over I was laughing so hard. Perhaps I was overly sensitive to language-related issues, having just spent the last few days with professional communicators. But, I couldn’t help but wonder if the gusty winds would acknowledge the permission they had been granted. Here’s the thing. Signs are content too. They direct us, inform us, but all too often, they misdirect us and confuse us. Sometimes they just make us laugh, not their intent, I’m sure. It’s not that I mind a good laugh, but when I need directions, or information, I need signs to communicate effectively. Take this gem, spotted at a Longos supermarket in Toronto. Since when is portion control an item in a supermarket? Besides, isn’t everything in a grocery store portion controlled? Aren’t oranges, apples, bananas, by their very design, portion controlled? You can buy a bunch of bananas, but presumably, eat one at a time, begging the question—are individual bananas included in the portion control aisle? What about individually-wrapped chicken breasts, or a steak? 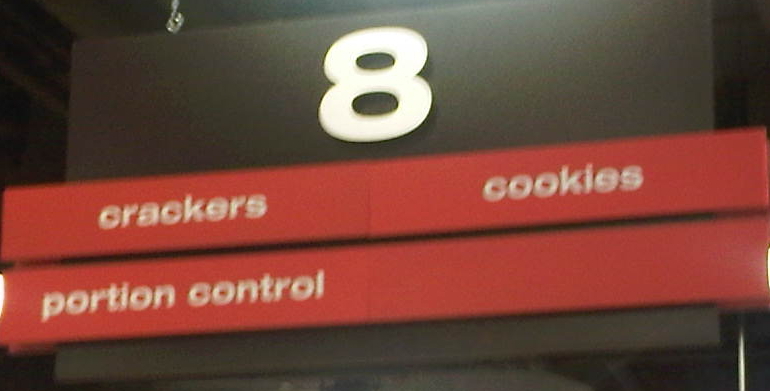 I think I get what’s going on here, but I’m not sure I’d go into a supermarket looking for the “portion control” aisle. Even if I were, it’s a strange category. After all, a package of something can have its contents separated into portions, but that doesn’t mean you can’t eat the whole box if you’re so inclined. To my way of thinking, this categorization is just weird, and misleading. I’m easily confused at airports. There’s so much going on, and so many signs demanding our attention. Sometimes, just getting to the terminal building can be challenging. At Toronto’s Pearson International, there’s a car park connected to a monorail station, with train service to the terminal buildings. The monorail waiting area is like a big hallway, with entrances to the monorail on both sides. It’s a great service, for the most part. We stood there for several minutes, mulling over the message. What does single train service mean? When all trains are operational, does the message say multi-train service, or two-train service, or three train service? Just how many trains are there anyway? Will single train service affect how long it will take for us to get to the terminal? Leaving a party one night, I was glad to see this sign, especially considering the few glasses of wine I had consumed. But, it still made me laugh! At least it got its warning across. And then there’s this one, in Toronto’s Gerrard St. Chinatown. Every time I see it, I giggle. 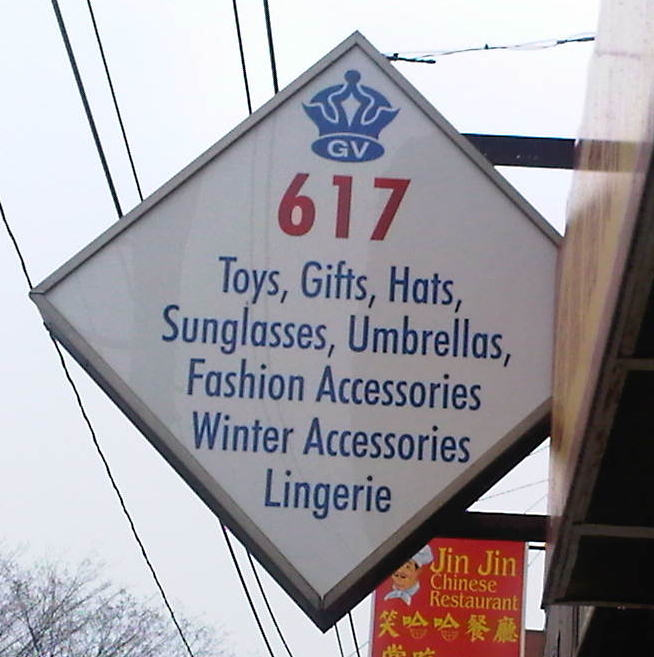 I wonder how the store owners chose the items to list on the sign. I have yet to go into the store to see what they really sell, and to figure out the odd categorization. What is a winter accessory, exactly? 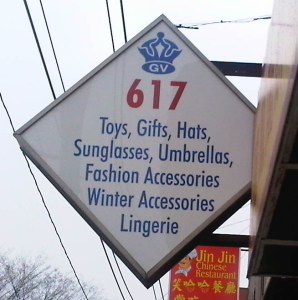 Hats, scarves, mits, I’m guessing, although hats are also listed separately. Could I also buy a shovel or an ice scraper here? What constitutes a gift? Couldn’t most items in the store be given as gifts? I’m not sure what the store’s name is; I simply refer to it as the Toys Gifts Hats store. 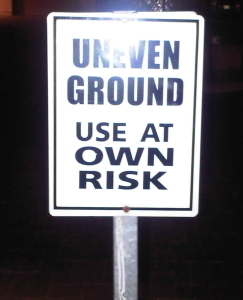 Signs can be funny, frustrating, useful (or not), misleading. I want whoever creates the content for signs to remember that signs communicate. The content has to be clear, it must not be open to interpretation, and occasionally, it can make me laugh, but only if its message is clear. Do you have any favourite signs? Send us your signs, tell us why or why they don’t work, and we’ll share them in our blog. Are personas a thing of the past? I recently gave a presentation to the Toronto Content Strategy Meetup Group on Connecting Content to the Customer Experience. Afterwards, someone mentioned that she was happy to hear someone talk about personas because at her company, they had decided that personas were over, period. In spite of some criticisms of personas (that they’re not all inclusive, that they’re artificial, fictitious, and not scientific, that personas can’t talk back), I believe that using personas is more beneficial than not using personas when it comes to connecting content to people. Unless you’re designing or writing exclusively for yourself, your team, or your company, you can’t really represent your customer. You are not the customer. Your organization and your team are not the customer. Even if you are also a customer of the organization you work for, you bring the organization’s biases to the table. You can’t help it. Personas will help to keep you honest, and the best personas are based on research. The customer is at the core of all your content decisions. Done well, a persona contains everything you’ve learned from your research. They tell a story about the people using your product, and include a face and a name that help you to remember who you’re writing for. Shared with everyone on the team, personas keep everyone on the same page. Sadly, using uninformed personas may lead organizations to think they are customer-centric when in fact, they haven’t engaged with any real people at all. If you don’t or can’t do the field work, you can still create personas based on best practices from other similar organizations, or based on information you gather from peer reviews, your sales or support teams. Real world stories are always better, but even without adequate field research, personas still help you to make the shift from thinking about users to thinking about people. And, that’s who your content is for.